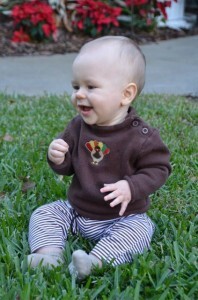 Oh my sweet Lovebug…it’s official…you are one!! We had such a wonderful weekend celebrating all that you are to us. Your party was incredible–so many friends and family members came over to snuggle you and you were a champ! You loved being in the middle of all of the action and you were so patient when people scooped you up and covered you in kisses. When it was time for the cake, you were like a king holding court! You sat in a high chair beneath our peach tree and performed for the ready audience. You were so tickled by the cake–you started slowly, but gradually warmed up to the idea and then there was no stopping you! I honestly believe you would have remained in that chair all day long if we had let you! Your actual birthday was reserved for just the three of us. 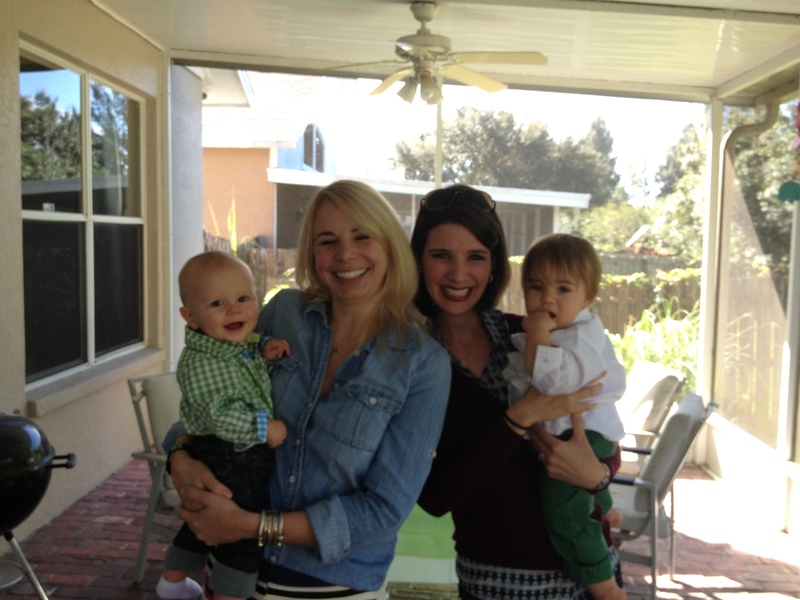 This day is SO significant for our family for so many reasons–it was perfect to just have you all to ourselves. Daddy came to your My Gym class in the morning and you LOVED having him there. You kept beaming at him from across the room and would motor his way at any opportunity. Speaking of which, your walking skills are nearing expert level! You have learned how to fall and you can get around very well on your own. Only one problem…you still can’t get up off the ground! Your daddy and I chuckle about this constantly. Your strong will refuses to learn to crawl and you seem to be perfectly content rolling around on the ground. You’ll figure it out eventually, I suppose!! Later on in the afternoon, we took you to the zoo, which you love. You always laugh at the warthogs, which is so precious! It was a beautiful day and we just soaked in every delicious drop of our time with you. Birthday dinner featured some of your favorites–your crock pot chicken meal, sweet potatoes, and of course…more birthday cake!! You quickly remembered your affection for cake and were much less tentative this time around. You swiftly picked up the entire second tier and crammed it into your mouth! We let you have as much as you wanted, but when a piece fell to the ground and Daddy took it away, you growled at him!! It was absolutely hysterical. Oh how we loved celebrating you. There has not been a single day in this entire year that I have not praised God for the incredible gift of you in our lives. To say that we are thankful is quite honestly the greatest understatement in the world. We are different people than we were a year ago…better people. You have changed our lives and our hearts in such a profound way and I am forever grateful. Every day I get to spend with you is an absolute gift and I treasure every memory made with you in my heart. Thank you for blessing us so abundantly–we are beyond excited to see what the next year has in store!!! I love you to pieces and bits, my one year old boy!!! Oh my sweet boy, your mama is a hopeless romantic. Lucky for me, I married your daddy…who not only understands and appreciates that, but also shares the same trait. We celebrate Valentines Day every year not out of obligation, but because it is an opportunity to pause, change our routines, and be extremely intentional about expressing the love we have for one another. I love your daddy so. very. much. I’m telling you this now not to make you roll your eyes, but so that you will know that true love is real. There is a growing idea in our culture that true love is something fictional…something that only exists in movies and fairy tales. There is a population of people who want you to believe that marriage is an outdated idea and that relationships that appear to have true love are somehow secretly flawed or fake. They are trying to tell you that true love doesn’t exist. Well, my sweet boy, it does. It’s real and raw and God has blessed us with it. Thanks to Him, your daddy and I have a marriage that makes me open my eyes every morning with a smile and close them at night awash in gratitude. Your dad makes me feel beautiful, challenges me to be the best version of myself, keeps me guessing, and loves me so well. He encourages me when I feel overwhelmed, he shows me he loves me in the most creative ways, and he makes me laugh constantly (no surprise there!). He is strong, he is passionate, he is smart. He has a hunger for adventure that surprises me, a mind that amazes me, and a heart that inspires me. I am head over heels in love with your daddy and have been for over 10 years. He’s not perfect. I’m not perfect. We are living creatures who mess up, hurt each other, and say the wrong things sometimes, but we forgive…we repair…we love. Each and every day, I thank God for bringing your daddy into my life and every day I choose to love him with every ounce of my being. I pray for you every night and frequently those prayers turn to the person who will one day capture your heart. Such a funny thought for my sweet 11 month old! As far away as it seems, I pray that you would never settle for less than the incredible life God has intended for you and this includes your love life. It may take longer to find and it might look a little different than you expect, but it will far exceed anything you could have crafted for yourself. I pray for your spouse and pray that you will have a relationship founded on faith. I pray that you will feel loved, supported, respected, encouraged, and empowered by your marriage. In praying for your future spouse, I also pray that you will be an honorable husband. That you will take your vows seriously. That you will love without reservation or hesitation. That you will forgive, demonstrate grace, and choose daily to show your love in many different forms. With the help of your daddy, you presented me with chocolates and a card asking me to be your first Valentine. I almost melted into a puddle right on the floor. With tears in my eyes, I snuggled you up and accepted your request, praying that when the time comes for you to ask someone new to be your Valentine, you would never settle for less than the true, beautiful, authentic love I have found with your daddy. Today I held on to you for just a bit longer before bedtime. We were going through our normal routines and I was soaking up the remaining drops of you for the day. I was saying my prayers for you, as usual, but suddenly the moment shifted. I’m not sure what snapped me out of my normal train of thought, but suddenly I realized I was in holy territory. Snuggled up in that glider in the corner, I was completely overcome by the awareness of what an absolute treasure you are to me. My senses went on high alert and I tried to absorb every detail I could in that time. I listened to your sweet, shallow breaths and watched your chest rise and fall. I smiled at your legs stretched out with your feet crossed at the ankles. I felt your precious hand rubbing mine and your hair tickling my arm. Exhausted from a day filled with adventures, you melted into my lap and for but a brief moment, we were one. I could just barely make out your profile in the light being cast from the hall and it literally took my breath away. I thanked God over and over for this day, for this gift of you, and for the divine privilege of being your mama. You are living grace to me. With the knowledge of every bit of this, God still gave me you. Divine grace and something I don’t ever want to take for granted. I didn’t deserve you, but here you are…the weight of you in my arms reminding me of how incredibly blessed I am to be a child of His and a mama of yours. So tonight, I lingered. I closed my eyes and held on to you for just a little bit longer. I breathed you in and with that, drew as close to heaven as humanly possible and said thank you for the millionth time for God’s incredible gift of you to me. 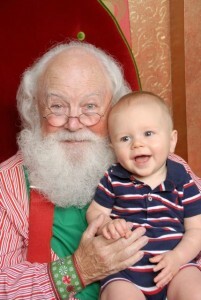 Before Gilbert left for Christmas tree season, we took William to meet Santa. It was nothing short of amazing!! 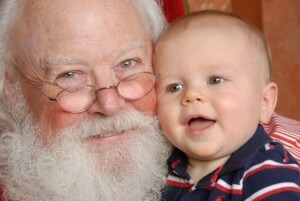 William was cool as a cucumber the entire time and was quite interested in the man with the fluffy white beard. Right before it was his turn, there was a young girl absolutely LOSING IT on Santa’s lap. William kept looking at her and then at us as if to say, “What’s her deal?” When it was his time, he snuggled right on up with Santa and gave us some of the BEST photos ever. Oh my sweet babee…we had the best conversation on our walk today and I just had to write it down. The day was beautiful–waning sunshine in the late afternoon sky and a refreshing chill in the air. We took our usual loop around the neighborhood and what can I say? God showed up. I started pointing out how God has blessed us so abundantly through nature. He could have given us only a few different animal species, but He didn’t. He flooded the earth with millions of different types of creatures and as a result, we constantly encounter a variety of animal friends. He could have limited our experience with one type of weather, but He didn’t. He has given us seasons (yes, even in Florida!) so that just as we are tiring of one type of temperature, another is ushered in giving us a renewed energy and enthusiasm about where we live. From there, we started talking about how incredible it is that the God who created ALL of that and more, wants to have a personal relationship with us. I shared a verse that was a part of my morning Bible study–Jeremiah 33:3 which says “Call to me and I will answer you and tell you great and unsearchable things you do not know.” Wow. We definitely camped on that thought for awhile. I pointed out that this one little verse tells us so much about our great and loving God. First, it shows us that we can talk to Him. We can do this wherever, whenever, and however. Sometimes this means praying out loud like we do when we say our nightly prayers. Other times this means praying in our minds when we are in the middle of a crowded room. The means doesn’t matter, the fact is that we can always talk to Him. This verse also shows us that God listens and hears us! In order to answer someone, you have to hear what they say, so that means the Creator of Heaven and Earth is actively listening to our every word when we call to Him! Is that amazing or what?!? Finally, it shows that after hearing our calls to Him, He responds. 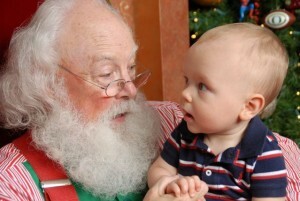 This relationship is not one-sided–we talk, He hears, and then He answers! While the verse doesn’t promise that we will hear the audible voice of God, it does tell us that He responds. Sometimes this is in that God voice we have in our heads and hearts while other times it is in things that happen around us. I can attest to this firsthand, my love. God speaks to me in both of those ways all. the. time. He will do the same for you–keep your eyes, ears, and heart open. Since we were on the topic of prayer, I shared another verse from my Bible study with you. James 5:16 says “The prayer of a righteous person is powerful and effective.” While it might seem CRAZY that God would listen to our prayers and answer them, the fact is He does. Not only that, we can ask Him for ANYTHING that is on our hearts. When you pray for something and God gives you what you asked for, please be sure to thank and praise Him! We did this just this week because you had a cold and we prayed that God would make you feel better. He did and we said THANK YOU to God for answering our prayer. Just like I would expect you to thank a friend or a family member when they give you a gift, we must be sure to thank God when He gives us the gift of answered prayers. That said–and please learn this early–we don’t always get what we ask for in prayer. In the same way that I don’t give you everything you ask for because I know what is best for you, God answers our prayers according to what is best for us. Yesterday you wanted to put the Christmas lights in your mouth. I said “No” and you screamed in protest. You just couldn’t understand why I wouldn’t let you do that–it looked like so much fun to you! I think we can both agree, since you are alive to read these words, that I made the right choice in not giving you what you asked for. ;0) God works the same way. We don’t often understand why He says no, but we can rest in the fact that He is faithful. We can trust that if He says “no”, it is always for our benefit. Oh lovebug, sometimes those “no’s” are SO hard. I have cried many tears over requests that God has said no to over the years. It’s so hard to understand why He doesn’t answer my prayers the way I want Him to in the moment. But every time that happens, after I stomp my feet and ask him “WHY? ?”, I rest at night knowing that He loves me and I trust that while I don’t understand why He said “no” I trust His will for my life. We talked about how sometimes God answers prayers with “yes” other times with “no” and finally we have to talk about when God says “Not now.” Sometimes God is willing to give us what we are asking of Him, but He wants to wait to give it to us on His time. Oooh this is hard too. Waiting is SUCH a bummer. When we come up with something we want, we almost always want it immediately. When God says “Not now” we have to be patient and trust that His timing is better than ours. This is a hard concept to grasp, even for adults, so I broke it down a little further for you with the following example. Let’s say you asked me to take you to Disney World. I said “Not now” but you REALLY pushed and I gave in and decided to take you. When we arrived at the park, the skies opened up and we were plagued with torrential rain for the rest of the day. We ended up having to leave the park after only an hour because the weather was so bad. Now…replay that same scenario, but this time I stick to my “Not now.” I know the weather forecast and it’s going to be a horrible day to visit the park. Instead, I opt to take you the next day and the weather is absolutely beautiful. We are able to enjoy a full day of fun–something we would have missed out on if I honored your request on your timeline. Remember: God ALWAYS has WAAAAAY more information than we do. If He says, “Not now” it’s because He can see a benefit to waiting that we can’t. Oh how I love these little chats with you. You kept glancing up at me and cooing in a way that melted my heart. Someday you will be an active participants in these talks and that just blows my mind. I love you so much, lovebug. Thanks for being incredible you. I am beyond blessed to be your mama. For 65 months of wedded bliss with the absolute love of my life. For celebrating a first Thanksgiving with the perfect baby boy I prayed about for many years. For family and friends who love me so well in every way and in every season. For turkey…for puppies…for crisp weather and Kodak moments. In short, for blessings, large and small, that reveal the heart of our loving God. As I basked in the details of this beautiful day, I couldn’t help but be consumed by the fact that I almost missed it. With that in mind, I will not let it end without raising my glass and saying thank you once again to all of my heroes and angels at Winnie Palmer, without whom I would not be here to celebrate. Words fall woefully short in expressing just how thankful I am this year. The experiences of 2013 have provided a perspective that prohibits me from taking any moment for granted and my heart is overflowing with gratitude. Today and everyday, I thank God for the gift of every moment…and for blessing me with far more than I deserve. 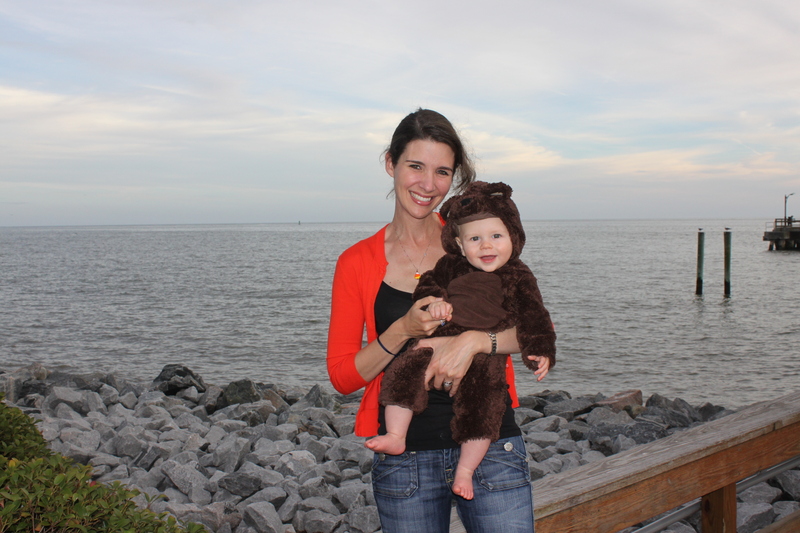 For William’s first Halloween, we hit the road for SSI. As it often happens, Halloween coincided with the annual FL-GA weekend, so William got to experience all of it in one fell swoop! We arrived on the island just in time for us to put him in his bear costume and head down to the Village. Since it is primarily a vacation town, there weren’t many Halloween festivities to speak of. 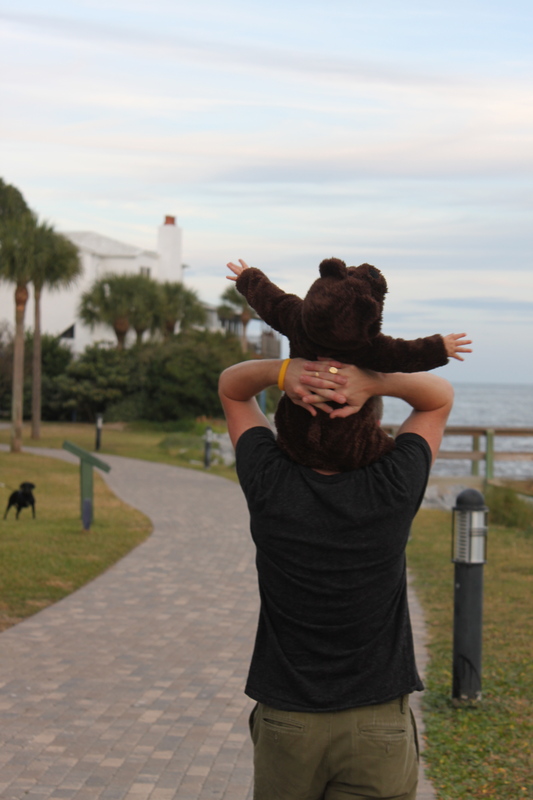 As we strolled along, we realized that this holiday would hold a significance for an unexpected reason…it marked the first time that William saw the ocean!! I say this with a slight cringe, even though it was a wonderful experience. 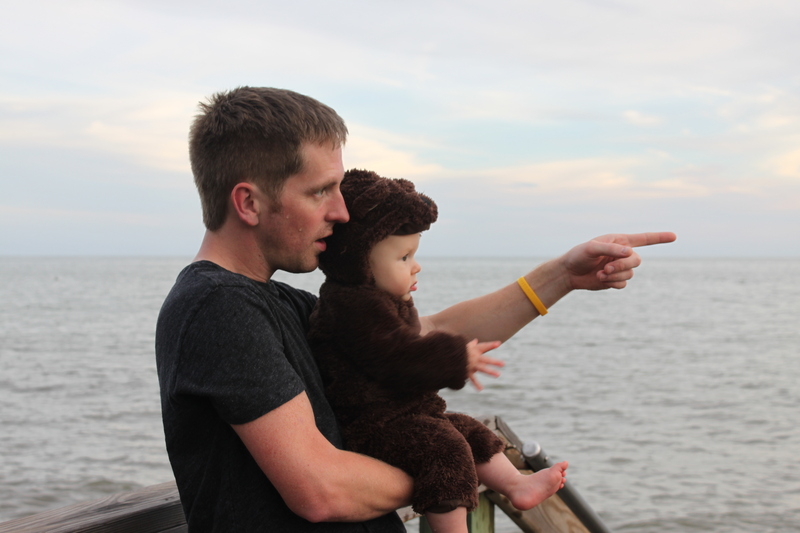 It just strikes me as funny that at nearly 8 months old, our Florida-born son had to travel to Georgia to see the ocean for the first time. Oops! 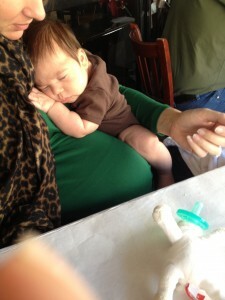 Sooo, my sweet little man has been teething and the discomfort has wrought havoc on his sleep. He is waking more frequently right now and is also rising well before dawn. Sweet. A few mornings ago, he woke up just after 5 am and was ready to start the day. We waited to see if it was just a fleeting desire, but when it was clear that he would not be going back to sleep, we developed a game plan. Gilbert went in, bundled him up, and popped him in the stroller. I made myself a nice large mug of coffee and decided to look on the bright side of our early morning…it was chilly outside, I had yummy coffee, and if all worked out we would get to see a beautiful sunrise! Once W was settled, we took off around the neighborhood. The crisp air invigorated me and I took the opportunity to pray and enjoy the quiet morning. William nestled in and relaxed as we walked our familiar route in an unfamiliar time. It seemed that this was the perfect solution to his fussy wake up and I was just about to pat us on the back for our brilliant thinking until…yes until. Such power in a single word. As soon as one hears/reads/utters the word “until” it becomes instantly apparent that something is about to change…and in this case, not for the better. The loop around our neighborhood is just over a mile. When we were as close to the halfway point as possible, William lost it. I mean, absolutely positively lost. his. mind. There were tears, there were screams, and my feeble attempts to reign him back in were fruitless. The serene setting I had only moments before embraced now turned into a wicked nightmare. The quiet only magnified the piercing shrieks and the once friendly looking houses were now certainly filled with angry, judgmental neighbors with their phones in hand calling DCF. I sang, I danced, I pulled out every toy I had stowed away, and there was absolutely no effect. In fact, at certain points my antics seemed only to add fuel to the fire, with his cries reaching the upper register of a banshee. When it became apparent that my usual tricks were not going to work this time around, I swiftly popped him out of the stroller. With his screams still slicing through the darkness, I threw my coffee into the seat of the stroller and started hauling tail toward home. With W still crying in my arms, I started singing “The Mexican Hat Dance”–our go to meltdown tune since he was a newborn. This turned down the volume, but didn’t eliminate the noise entirely. With only a single bullet left in my gun, I drew out the iPhone and loaded the “Rattle” app as quickly as I could. Magic: crying stopped. Being carried, sung to, and entertained with technology was the solution I sought. Any attempt to withdraw any portion of this twisted trifecta resulted in more tears. And so we motored on. I was as happy as a mama could be walking with a baby in one hand, simultaneously pushing a stroller and engaging an app making farm animal noises with the other, while singing “The Mexican Hat Dance”…all before dawn. As we rounded the bend for home, we passed a jogger taking full advantage of the cool, peaceful morning. I cringed as we neared this unsuspecting person, who until this point had no doubt been living under the blissful assumption that the neighborhood was free of crazies. Not the case. I could only imagine how ridiculous I must look to someone outside the insane world of babies. I had to appear absolutely certifiable. When our eyes met however, I found something I wasn’t expecting…familiarity. On this woman’s face, I saw the unmistakable acknowledgment of someone who knew exactly what I was enduring. A fellow mama in a different season, she recognized my world and gave me the knowing smile that said, “Don’t sweat it…I have been. there.” I could almost see the battle scars on her face as she shook her head and closed her eyes, no doubt recalling countless moments of her own insanity and offering as much compassion and empathy as she could. We hit the road this weekend to celebrate William’s BFF’s first birthday!! Harrison celebrated in style, rockin’ a bow tie and making short work of his delicious cake. This was a long-awaited visit, because it marked the first time that William and Harrison could officially “hang.” They met when William first arrived on the scene, but I’m fairly certain William slept through the entire encounter. Truthfully, they met even before William was born. I visited Summer when Harrison was just weeks old and I was five months pregnant. Harrison snuggled my belly and we knew they were destined to be friends for life!! It was so much fun to watch them together. Harrison’s got 5 months on William, so he was motoring around while William was stuck in one place. He would bounce in fits to get me to move him closer to the action. What an absolute blast it will be to watch these boys grow up together!!! Happy Birthday, H-man! We’re so glad God gave us you!! My favorite part of our conversation though, was about prayer. I have told you before that prayer is just a fancy word for talking to God and that you should never feel like you have to have the “right” words. Talking to God is just like talking to a friend. Actually, it’s even cooler because when you have a hard time expressing how you are feeling, God gets it no matter what. In fact, the Bible even says that when you can’t figure out what you want to say to God, He helps fill in the gaps because he knows our hearts (Romans 8:26). Amazing!! So yesterday, we talked to God. We told him about the people in our life who are sick and hurting and we asked God to help them feel better. We told Him how much we enjoyed the weather and how we would love to have more of it. We thanked him for keeping us safe when we traveled to and from Tampa and for blessing us with such a fun day. We told God everything we had on our hearts–thanks, praise, requests, all of it. While we could only hear our voices and couldn’t see what God was doing, you can be assured that not only was He listening, our prayers were causing him to act. I’m not making this up! Matthew 18:19-20 says this: “When two of you get together on anything at all on earth and make a prayer of it, my Father in heaven goes into action. And when two or three of you are together because of me, you can be sure that I’ll be there.” Isn’t that incredible? So we were just out enjoying a beautiful walk and having a conversation with our friend and because of it, things started happening in heaven! I hope you remember that throughout your life. Every day I pray that you would not only know who God is, but have a relationship with Him. It is without question, the biggest prayer I have for you. It trumps everything else because I know that if you have a relationship with God, He will see you through EVERYTHING else…no matter the circumstance. I know, because it’s happened to me. Oh my little lovebug, I love you more than you will ever know. I am treasuring every moment with you and can’t thank God enough for blessing me with you!! !